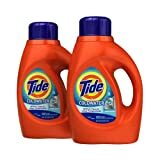 Tide Laundry Detergent, 50 Ounce at $4.95 Each – Hot Deal! when you know how to combine the discounts! Just $4.95 each – a huge saving! Contains up to 44% less water than before, so you get twice the stain-fighting power in every drop. Smaller bottle / less plastic means less waste, better for the environment. The price for 2 50 ounce bottles is just $11.40 when you sign up for Subscribe and Save which also gives you free shipping (cancel at any time). There is also a $1.50 coupon to clip when you log into your Amazon account. This takes is down to $9.90 which is just $4.95 per bottle.